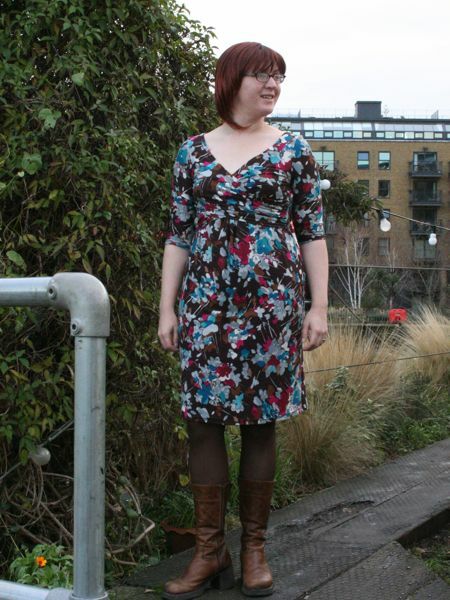 The second of my winter knit dresses is the cross-bodiced Burda WOF 06/09 #129. I’ve had my eye on this pattern ever since it came out, but I was amazed to see that no one had reviewed it yet on PR, so it’s definitely an undiscovered gem as far as I’m concerned! 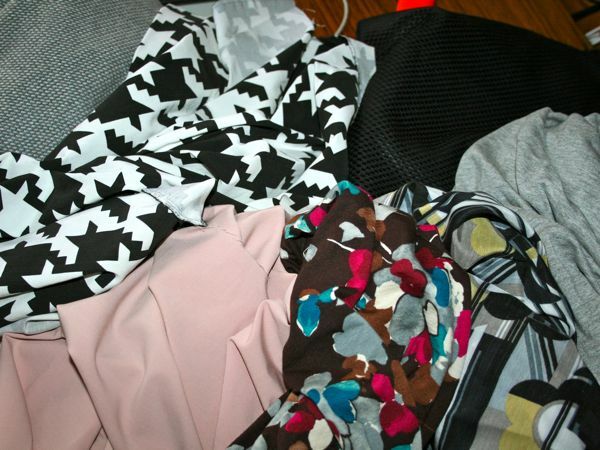 I recently ordered a big batch of fabrics from Totally Fabrics (more on that later) in their 40% off everything sale including this brown floral viscose jersey print with shades of teal, fuschia, and grey thrown in. I only ordered one metre (of 1.5m available stock) but when it turned up, it turns out they gave me the whole 1.5m rather than have an awkwardly short leftover! Score! Even so, there was no way I could squeeze this entire dress out of the yardage available, so I had to do a clever amount of fabric Tetris, shorten the hem by 2 inches, make the sleeves 3/4 length, and sew the hidden front bodice piece from a constrasting grey marl jersey. 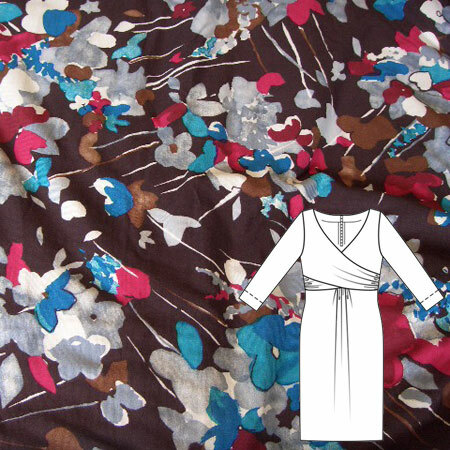 I recently ordered a big batch of fabrics from Totally Fabrics (more on that later) in their 40% off everything sale including this brown floral viscose jersey print with shades of teal, fuchsia, and grey thrown in. I only ordered one metre (of 1.5m available stock) but when it turned up, it turns out they gave me the whole 1.5m rather than have an awkwardly short leftover! Score! Even so, there was no way I could squeeze this entire dress out of the yardage available, so I had to do a clever amount of fabric Tetris, shorten the hem by 2 inches, make the sleeves 3/4 length, and sew the hidden front bodice piece from a contrasting grey marl jersey. 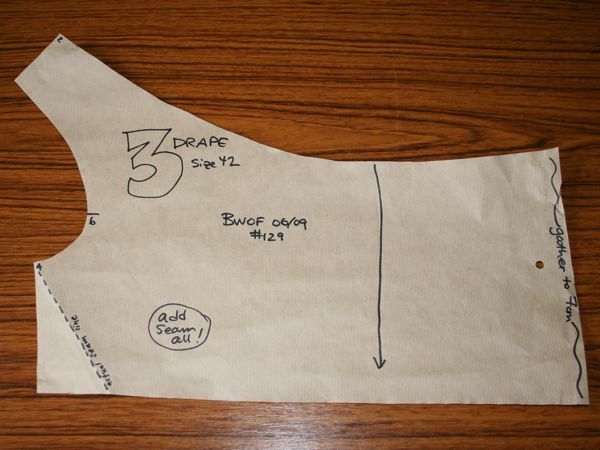 The way the dress is constructed, you have a v-necked bodice that attaches to the gathered skirt, but then the bodice is completely covered by two drape pieces that crossover in the front and have nice gathers at the side seams. 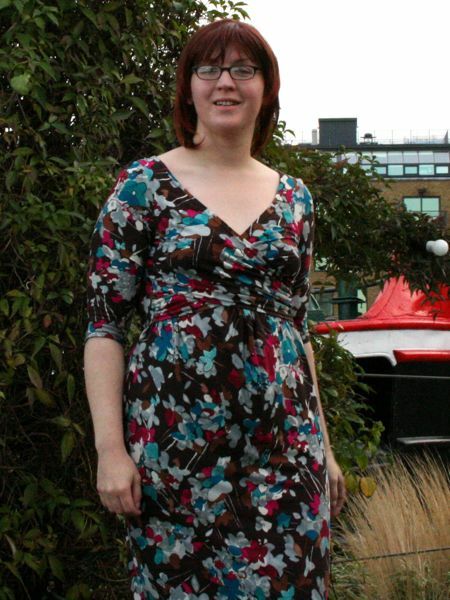 To be able to squeeze this dress out of the available fabric, I made this hidden front bodice piece out of a different fabric and it was definitely the right choice because it doesn’t show at all! One thing I did notice is that the bottom of the drape gapes open a bit if you sew it exactly as intended – I fixed this by pulling the bottom a bit more into the side seam after my first fitting with basted seams. You can see my dotted line in the bottom left in the photo above showing where the actual seam line ended up. Another point about the drapes is that Burda would have you just fold back the top and bottom seam allowances and just “sew in place loosely by hand”. WTF? Seriously, on a knit, on pieces that are on show and will flip out in exactly 10 seconds? That’s just plain stupid. Fold them under and coverstitch or twin-needle stitch those babies in place. It doesn’t take away from the design of the dress at all, and everything stays in place. The other really weird thing about these instructions is that there’s a step here that I honestly have no clue what they’re trying to say: “Stitch upper front to lower front, catching a strip of fabric, about 1cm wide (cut lengthwise), on lower front, on each side of gathering.” I read this over and over, and I still have no idea what they’re on about. I just stitched the upper front to lower front with total disregard for the rest of that sentence, and my dress came together perfectly, so god knows what fiddly crap they wanted us to do there. 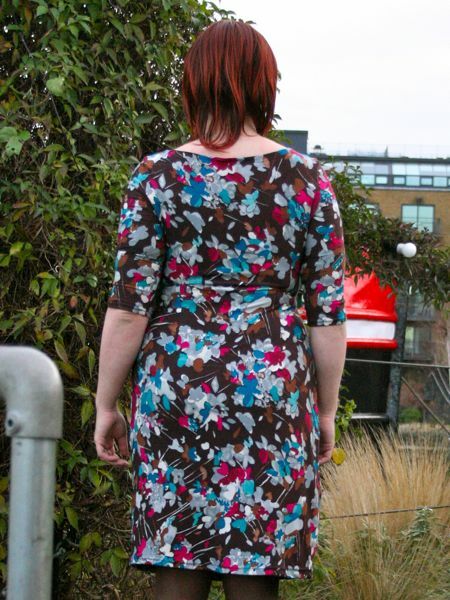 Despite these two complaints about Burda’s methods, I really cannot find fault with the pattern whatsoever, and it is just SO flattering to wear. Honestly, those drapes really cinch in the natural waist and add nice gathering to the bustline while the nice V neck draws the eye downward. The neckline isn’t very low for Burda’s standards, but if you have issues with it nonetheless, it’s really easy to just redraw the V-neck of the inner bodice to be higher and create a faux-camisole look instead. 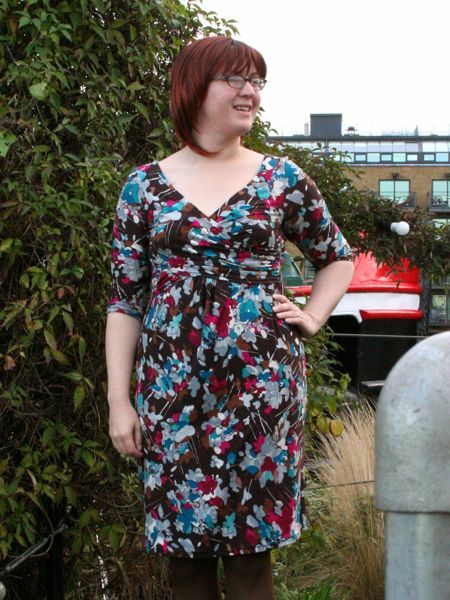 Really truly, I can’t believe I haven’t made this dress before, and I’m astonished no one else I’ve seen online has, either. 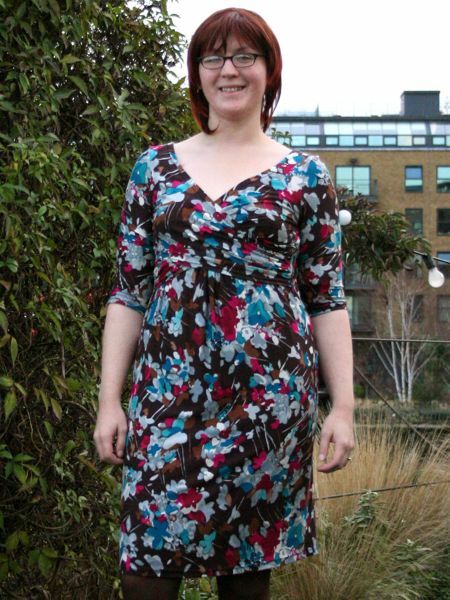 It’s a really quick, really flattering knit dress that works for all seasons, and I might even go as far as say this is my favourite pattern Burda have published this year. It’s that good! 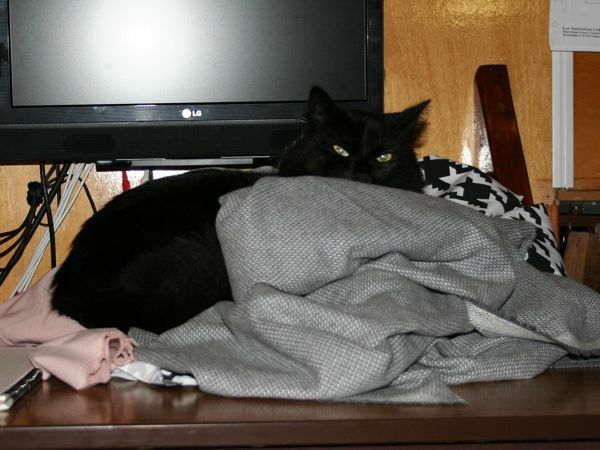 Separator image Posted in Gallery and tagged with bosco, bwof, dress, knit.